You ever gotten seen a movie, or read a book, or listened to an album you didn't particularly care about, only to find out it was really good when you gave it a chance, and it then became one of your favorites? Turns out the same thing can happen with toys. One of the most terrifying alien races humanity has ever faced, the Brood reproduce by hatching their eggs inside living hosts, transforming them into their kind. Only the heroic efforts of the X-Men have prevented these ruthless masters of bioengineering and weaponry from establishing a reign of terror on Earth. Traveling through intergalactic space in their living "space whale" starships, the Brood are a constant threat to all life in the universe! While the Brood have traditionally been X-Men villains, they've lately been showing up all over the place. Their ranks out in space have been decimated by the army of Annihilus, and (a surprisingly humanoid) one called "No-Name" was part of the army Hulk led to Earth. The new Ms. Marvel series started with a storyarc about the Brood, and they've recently reared their creepy little heads again. Basically, the Brood have gone from being "another X-Villain" (as some fans have complained) to a problem gnawing at the Marvel Universe from a lot of different directions. We've only ever had two Brood figures before, starting with the first release in 1993, and then the Marvel Select Alien Legends two-pack earlier this year. That's a fairly substantial gap. Of course, neither of those previous figures was a queen, so this BAF is still new. 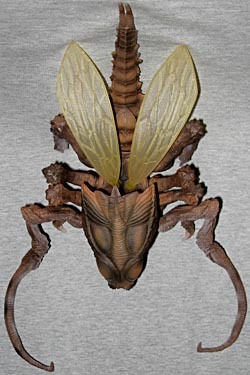 The Brood Queen (not the Queen Brood, like the front of the ML3 packages say) comes in 13 pieces: head, torso, tail, two wings and eight legs. The Hasbro BAFs don't plug together as tightly as ToyBiz's did, but the figure isn't going to fall apart or anything. The included instructions aren't really clear on which leg goes where - in each set of three, there are two that share the same mold, and one larger leg with a unique sculpt - but things seem to fit best when the large leg is in the back, and the doubles are in the front. In the comics, the Broods' size isn't portrayed consistently: sometimes they're about the size of a German Shepherd, other times they're nearly as big as a person. 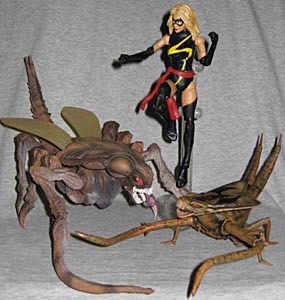 The Marvel Select Brood went the doggy route, and the Queen is in scale to that. Height is a useless measure when you're talking about a horizontal creature - if we tell you the top of the tail is 5¼" tall, what does that mean? If we claim it's 12" long, or 8" wide, doesn't that all depend on how you pose it? Here's what we can tell you. her face (that is, just the area immediately around the mouth and eyes) is bigger than most MLs' heads. The top of her head will end up being about 3" from the ground. If you just measure based on the feet rather than the arms, she's about 5¼ wide. Put the Brood Queen next to an average ML, and she looks plenty big. That's all you need to know. 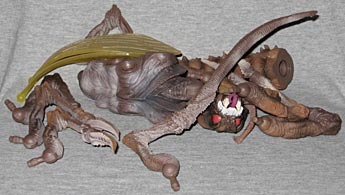 The Brood Queen is articulated fairly well, but it's not hard to imagine where some additional joints might go. The wings are true balljoints, which allows for plenty of motion. Her tail can swivel, but that really isn't a point of articulation so much as it is an assembly joint, so don't count that one. The head is a balljoint, and the jaw is hinged. Each of the legs is on a balljoint, though they're crowded so tightly onto the body that they'll only move so far before bumping into one another. The arms are also balljointed, but you almost have to turn them around backwards to get the tentacles to point forward - swivels at the elbows would have fixed that. Yes, the arms are bendy, but only the tentacles will hold a pose, thanks to their internal wires. The detailing in the sculpt is excellent. Almost every inch of this monster is covered with some kind of texture, whether it's plates of insectoid armor, rough bumps, or even deep wrinkles on what passes for skin. The wings have veins and a cellular structure, and even the tongue looks fleshy. 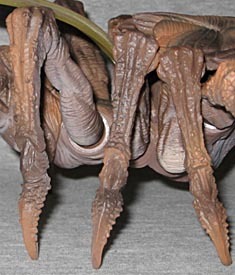 If fact, the only areas without any sculpted detail are the eyes and the two smooth pods immediately above them. The lower jaw is actually bifurcated - like the toilet seat in a public restroom, the two sides don't join in the front. And thankfully, all that detail is supported by a very nice paint job. The Queen is a dusty brown, with darker shadows and tan highlights. The eyes are painted in such a way that they actually look translucent, with shadows cast naturally, rather than created by a paint app. There's just a hint of orange in some of the highlights, which just adds to the realism. The tongue is dark magenta, and the teeth are off-white. This is one damn fine paint job, Hasbro; keep up the good work! 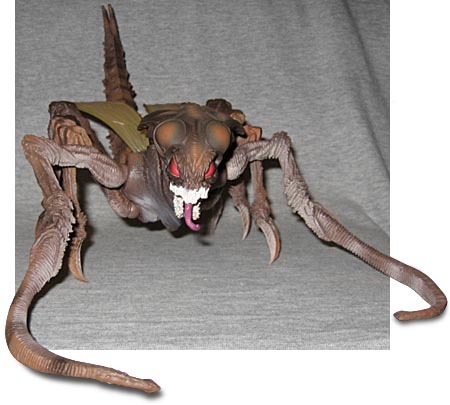 The Brood Queen is not a figure that photographs well, from any angle - even the professional press shots on the back of the card make the toy look like crap. Really, right up until I put the last pieces together and saw the completed BAF, I didn't expect to like it very well. Fully assembled, though? This is a figure that is unquestionably more than the sum of its parts.